← In the News: Lindsey Graham, Garland, TX, God’s Plaintiff, and more! Samira K. Mehta interviewed Professor Adam H. Becker about his new book, Revival and Awakening: American Evangelical Awakenings in Iran and the Origins of Assyrian Nationalism on the Religion in American History Blog. You can read an excerpt from Becker’s book here. One of the most exciting things for me in this project is that when you work on antiquity and you have a good sense of the kind of cultural theoretical thinking we do, for example, in religious studies, you find yourself often simply pointing out how different the past was. So much of our theoretical apparatus has developed explicitly and implicitly answering the question about modernity, what it is, how it happened, did it happen, is it pluriform, etc. In this project I was able to follow that story—of course, a particular rendering of it with certain nuances–through my own sources and observe the Syriac tradition as it was transformed within the missionary encounter. There are certain interventions I wanted to make in that theoretical conversation. One is the relationship between religion and nationalism, which I think remains stuck in a certain secularization narrative, one we see built into Anderson’s work and repeated by many. Another is the fundamentally social basis of even the most interiorized forms of piety. There is a lot that has been said and that needs to be said about secularism and atheism around the world and we do our best to cover all of these angles. That said, the conversation was really all over the map this week. It should go without saying that no one deserves to die this way or for these reasons. But, what do you do when the ideology of Western “New Atheists” is, itself, violent? We still think that Luke Savage‘s “New Atheism, Old Empire” for Jacobin last winter is the best commentary we’ve read on the foibles and failings of New Atheism. But these debates are far from over. This reminds me a bit of Ta-Nehisi Coates’s recent argument that pleas for nonviolence in Baltimore are ultimately demands to back down and comply. “When nonviolence begins halfway through the war with the aggressor calling time out,” Coates states, “it exposes itself as a ruse.” Similarly, for Chomsky to politely return to the philosophical premise of Harris’s choosing would be to ignore the larger context that makes his arguments flawed in the first place. After reading the debate, I was left with the impression that Harris has a knack for speaking truth to the powerless – and in doing so, sounds quite a lot like the religious fundamentalists he so disdains. All of it just makes us want to go back to a time when Noam Chomsky had much more worthy adversaries. Ironically, Coyne’s distaste for such progressive theological discourses is something he has in common with his real opponents, Christian fundamentalists, who share his operative theory of faith as dogmatic certitude and his understanding of the Bible as the source document for empirical knowledge of the universe. At several points in his lambasting generalizations about “vociferous and liberal theologies” that don’t fit his understanding of religion as dogmatic faith, I could as easily have been reading a Christian fundamentalist apologist like Josh McDowell (Evidence That Demands a Verdict) or Norman Geisler (I Don’t Have Enough Faith to Be an Atheist, written with Frank Turek). For them as for Coyne, any theology that doesn’t perceive science generally and evolutionary biology specifically as its enemy doesn’t deserve to be taken seriously as theology. We appreciated Sarah Posner‘s take on it all, “5 Reasons You Shouldn’t Overthink the New Pew Data’s Impact on Politics” in Religion Dispatches, but preferred mostly to retreat into the work of renowned religionist, Professor Stipe. We love Bookforum‘s “Omnivore” posts. Monday’s edition, “How freaked out should you be about the Islamic State in America” was especially excellent. Think of it as your sub-sub-round-up-round-up. Marginalia is also always reliable for smart reading. This week’s “ISIS and the US Government: The Propaganda War” by Thomas J. Whitley is no exception. Yet it still seems destined to fail. ISIS (and their potential recruits) will dismiss this as “propaganda” just as quickly as the U.S. dismisses ISIS’ “propaganda.” This strategy has been in place for more than a decade and we have yet to reach the desired result. The lack of effectiveness, though, is easily overlooked because this is what the U.S. has always done. As in marketing, so in government – and even more so when it’s the government doing the marketing – the status quo often wins the day. LET’S TALK ABOUT MUSLIMS WHO AREN’T IN ISIS, SHALL WE? Rafia Zakaria writes powerfully about “Writing While Muslim: The Freedom to Be Offended” for the Los Angeles Review of Books. Honoring Charlie Hebdo, then, represents a particular coming together of two different but coexisting Western prejudices, both posing as commitments to secular ideas, and neither really having anything to do with freedom. Sigh. “Officials Threaten to Close Mosque Installation at Venice Biennale” reports Randy Kennedy for The New York Times. The project, by the Swiss-Icelandic artist Christoph Büchel, serves as Iceland’s national pavilion for the Biennale and is intended in part to highlight the absence of a mosque in the historic heart of Venice, a city whose art and architecture were deeply influenced by Islamic trade and culture. But the idea has upset Venetian city officials and police authorities, who have warned that the mosque poses a security threat because of possible violence either by anti-Islamic extremists or Islamic extremists upset that the mosque has been created inside a disused Catholic church. City officials have also argued that special legal permission is needed within Venice to create a place of worship, and they have rejected claims by Mr. Büchel and Icelandic art officials that the mosque is a simply a work of art functioning as a place of worship. 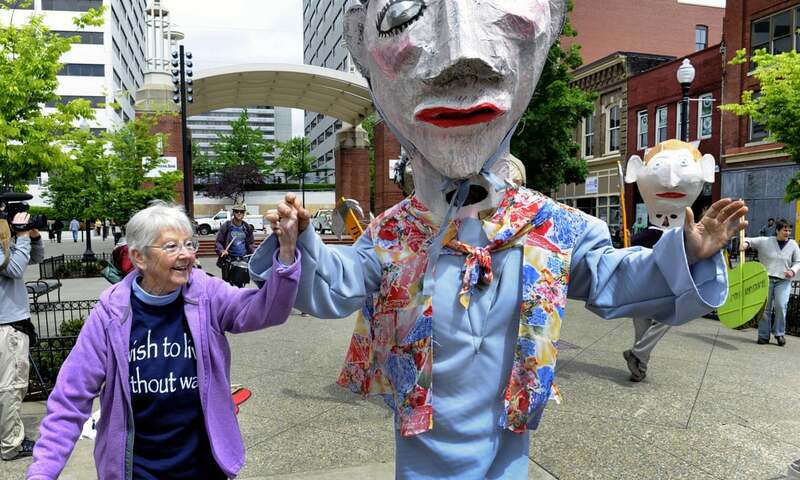 From Nones to nuns. Al Jazeera reports that “Appeals court overturns sabotage conviction against nun.” We’ve suggested it before and will recommend doing so once again: You can read more about Megan Rice and her comrades in Eric Schlosser‘s “Break-in at Y-12” from The New Yorker a couple of month’s ago. We followed the arrow and passed through a small courtyard before reaching the end of the hallway where we found a window with a three-chambered lazy susan. This was the torno indicated by the sign we’d seen, and it looked like a small revolving door, but with brown-painted wood instead of glass. Taped to the wall on the right side of thetorno was a price list. We’d made it … now all we had to do was figure out how to order our cookies. Grumblegrumblegrumble. “Nightly News Turns to Bishops about Contraception More Often than Docs,” shares Patricia Miller in Religion Dispatches. And the fact that OB/GYNs were so rarely used as sources of information is troubling given how often the Catholic bishops made false medical claims that emergency contraceptives, which were a key point of contention in the mandate, were actually “abortion-inducing drugs.” In fact, the study found that the most common method of contraception discussed in the news segments was emergency contraception, which was mentioned one-fifth of the time in the approximately one-half of segments that talked about a specific kind of contraception. The New Inquiry continues to publish beautiful work about cities and religion. The latest, from their new “Trash” issue, is “City of Praise” by Sarah Bivigou. Cuban President Raul Castro paid a call on Pope Francis at the Vatican on Sunday to thank him forworking toward Cuban-U.S. detente — and Castro later said he was so impressed by the pontiff that he is considering a return to the fold of the Roman Catholic Church. “In Canada, aboriginal pastors mix Christianity with Native Spirituality” reports Gian-Paolo Mendoza for Al Jazeera America. Also in the news up North, “The Patron Saint of Mexico’s Drug War is Making Inroads in Canada” reports Vice‘s Maria Vanta. Cindy considers herself part of a nascent community of non-Latino devotees in Canada who are drawn to Santa Muerte, otherwise known as Saint Death or Our Lady of the Holy Death. She’s heard of public shrines in Montreal, although her own worshipping has been in the privacy of her own home, before votive candles purchased in Toronto’s Kensington Market. Oh! 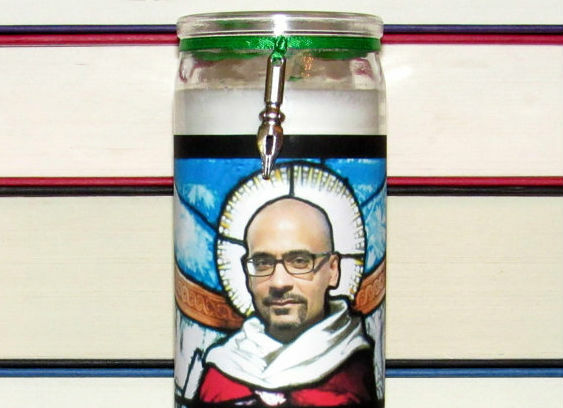 And speaking of candles, Sainted Writers, Etsy’s latest gift to the Internet. We loved reading Elizabeth Harper hunt for “Crocodile Prayers” in “a reptilian pilgrimage to Spain” for Killing the Buddha. I visited the church of San Ginés on safari like a fool. No one safaris in Madrid, and it’s frowned upon to safari inside a Catholic church. I went there to hunt a crocodile. Specifically, a taxidermied one rumored to be on display. The property has 26’ ceilings, arched windows, a dressing area in what was once the choir loft, a master suite with “a sense of royalty” (according to the Zillow listing), three floors, seven bedrooms, and eight baths. If Bey and Jay did purchase the former church, congratulations on their real-estate acquisition. And if not, mazel to the property’s real owner for the now inflated value of their home thanks to the Beyoncé association. 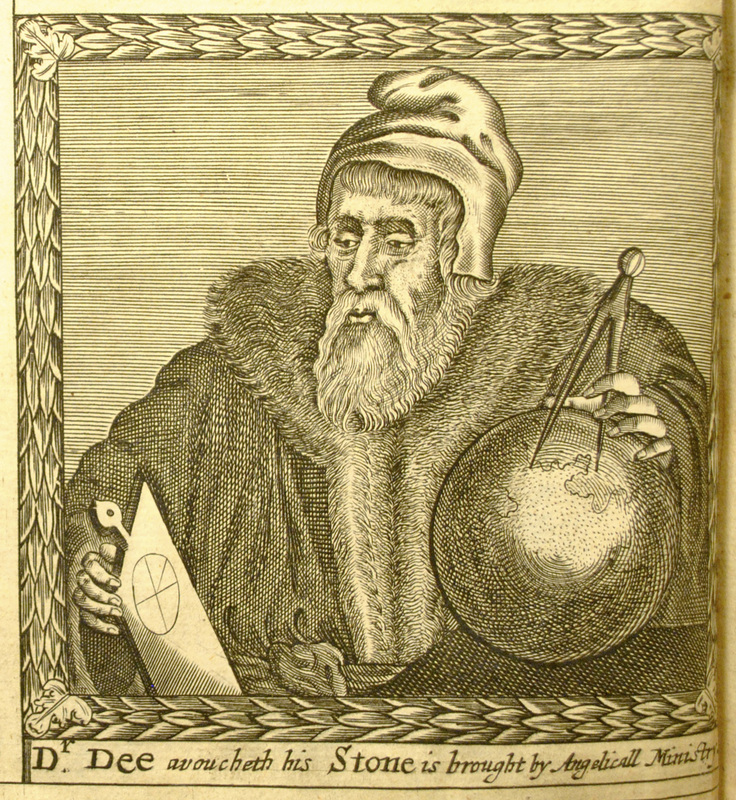 Benjamin Breen shares the story of the “Wizards of the Coast: John Dee and the occult in California” in The Paris Review‘s blog. The Fairfax, California, co-op where I worked as a teenager was a haven for this sort of thing, and I have no doubt that my wizardly interlocutor—the DMT guy—was a Dee fan of some kind. But the connection goes deeper than this. Dee was also, in an oblique way, a fan of California. The New Books Network really is terrific. This week we got to hear about Andrea Jain‘s Selling Yoga: From Counterculture to Pop Culture. Overall, what we find is that while yoga has been mediate through an emerging global consumer market and branded for strategic purposes it can still be seen to serve the function of a body of religious practice for many practitioners. In our conversation we discussed Hindu, Buddhist, Jain variations of yogic practice, Ida Craddock’s Church of Yoga, legal definitions, Iyengar Yoga, Siddha Yoga, and Anusara Yoga, Theosophists and Transcendentalists, Swami Vivikenanda’s Vedanta Society, counterculture yogis, consumer culture and the mass market, Christian Yogaphobia, the Hindu American Foundation, and the politics of yoga. Speaking of of history, culture, religion, politics, and India, Siddhartha Deb explains “What tales of ancient Vedic aircraft tell us about India’s place in the Modern world” in “Those Mythological Men and Their Sacred Supersonic Flying Temples” for The New Republic. In the May 7 issue of The New York Review of Books historian Anthony Grafton reviews an exhibition at the National Gallery of Art in “The Ravishing Painting of Piero di Cosimo.” Reading Grafton is always a delight, but what we most enjoyed from this piece was an online gallery called “Piero le Fou” in which he writes that “Though overlooked by many of the nineteenth century’s great critics, [di Cosimo] produced some of the most handsome and dignified religious paintings of the late fifteenth and early sixteenth centuries, and he also crafted “startlingly vivid portraits of individuals and strangely evocative images of religious objects.” So very worth a read and a look. “As a Jew you are also an American, but somehow also not,” Chick muses. I could well hear these words emerge from my father’s mouth, and from others of his generation, and for a few bunkered-in Jewish stalwarts of my own. But how I disagree, generationally and experientially, with that line of thinking. In post-Seinfeldian, post–Larry-Davidian America, the very opposite could be inferred: “As an American you are also a Jew, but somehow also not.” The fantasies of being pogrommed out of New Hampshire by an anti-Semitic militia nonetheless serve as a useful reminder of what post-Holocaust life was like for a generation of Jews who believed the ashes of the crematoria could one day fall upon the Berkshires. “It’s a sacred tea to a lot of people who come into our temple. So to have a raid, saying we can’t do the sorts of practices that we do on a daily basis is rather disturbing,” Dilts said. You know what else has alcohol in it? Bourbon. You knew that, though. What you maybe didn’t know about is “The Forgotten Jewish Heritage of Kentucky Bourbon Whiskey” reported on by Reid Mitenbuler in The Atlantic. After Russia grabbed hold of many Eastern European enclaves, the liquor business was often one of the few jobs where Jews weren’t restricted, meaning that Jews have “brewed, distilled, and sold all varieties of intoxicating beverages to both Jews and gentiles since the beginning of the Diaspora,” according to the book Jews and Booze by Georgia State University history professor Marni Davis. By the second half of the 19th century, increasing numbers of that diaspora, including Bernheim, began arriving to the United States. Speaking of things forgotten and Jewish, “Secret Jewish cemetery survives in Detroit’s GM car factory” reports Jeff Karoub for Haaretz. While the arrangement is unconventional, Zuckman described the relationship between the automaker and cemetery officials as “very good.” Some landscaping work and headstone repairs are needed, but the grounds and graves are in generally good shape given their age. Clover Hill Park is responsible and pays for upkeep, though GM has access in case of emergency. Somewhere in all this talk of Saul Bellow, Kombucha, that GM cemetery, and Jewish Bourbon, there’s Simon Rich. Did you ever read his incredible four part series “Sell Out” in The New Yorker? If not, please, please do. Soon, though, I have another thought. When I freeze in brine, Sarah was with child. Maybe I still have family in Brooklyn? Maybe our dreams have come true? The science man turns on computing box and types. I have one great-great-grandson still in Brooklyn, he says. By coincidence, he is twenty-seven years, just like me. His name is Simon Rich. I am so excited I can barely breathe. Maybe he is doctor, or even rabbi? I cannot wait to meet this man—to learn the ending of my family’s story.